What's Really The Fastest Production Car In The World? Yesterday, I used this space to describe how slow the traditional news was going to get over the next couple of months. Boy was I wrong. Lots of interesting things happened. I make no promises about today. It could be fascinating. It could be slow. Either way, we've got a few stories in our back pocket I think you'll enjoy. And now… on to the news! 1st Gear: What Is Fast? 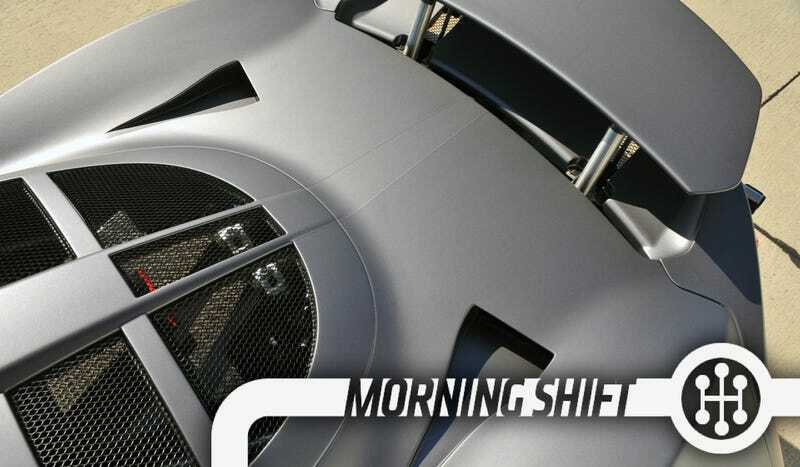 Yesterday, we learned officially that the Hennessey Venom GT hit 265.7 MPH in a straight line. That's fast. We said it was technically the fastest production car you could buy based on the same reasoning that John Hennessey uses. Namely, we said that while a Bugatti Veyron SS can go 267.8 MPH, it was electronically limited to 258 mph for all buyers. That's what's been reported, even for the World Record Edition SS. Not so fast says Bugatti, which told Fox News those five models were unlocked, even though that would mean destroying the car's tires. Hennessey says that, given a high-speed ring, he could hit that number. We'll see (we hope). It's also worth noting that, from 0-to-300 KPH the Venom GT is faster than the Veyron SS over the same distance. Is that fastest? More importantly, do we care? Both the Venom GT and the Veyron SS are two different ways of approaching the same problem of going as fast as possible without exploding into a fireball and I don't know that the Veyron SS customer is the same as the Venom GT customer. We're in that long lull in between the New York Auto Show and the Los Angeles Auto Show, which means in theory there should be no big car reveals. Alas, those rules are changing. As Paul Eisenstein notes, Toyota may not wait to show off the new Corolla for LA. Based, we think, on the Toyota Furia Concept, a new Corolla design may be revealed early. Where would they do this? Probably at their own custom event where they don't have to share airspace with other automakers. I was initially put off by the Bentley EXP 9 F SUV, but a few moments spent with the real thing and I was impressed with how much it looked like a Bentley. Then we heard it was being delayed and I expected to feel conflicted. I wasn't. It was a great version of a Bentley SUV, but they've gotten so good at building cars lately I'm not going to sweat it. The Wall Street Journal follows up with Bentley to find out exactly why. Part of it was the design. Part of it is where they're going to produce it. All of it appears to point to an SUV happening eventually, just not right now. If you're a publicly traded company you're bound by rules to make sure that all of your investors have equal access to information. Thus, when the CEO of Netflix posted an update to Facebook there was some hand-wringing over whether or not that gave everyone an equal shot at getting the info. It should be a simple "duh," since everyone has equal access to information on Facebook, but the SEC still had to investigate it and make sure it was kosher. Thankfully, they made the right decision and determined you can use Twitter or whatever to distribute information so long as you tell your investors that you might do so. We look forward to future 10-K forms from Ford being distributed via Scott Monty's Instagram. Subaru is recalling 200,000 Legacy and Outbacks over corroded brake lines in places that use salt on the roads. Salt water could splash onto the brake lines, causing them to corrode, leading to a brake fluid leak, leading to an increased risk of crashing. Imagine you're heading towards a fireworks stand and all of a sudden the brakes stop working and you crash into it and experience… fiery death! Which hasn't happened yet. There have been no reported accidents. "Fast & Furious," the fourth film in an action-movie franchise centered around the world of illegal street racing, debuts in U.S. theaters on April 3, 2009, kicking off a record-breaking $72.5 million opening weekend at the box office. "Fast & Furious," starring Vin Diesel, Paul Walker, Jordana Brewster and Michelle Rodriguez, recorded the all-time highest-grossing opening of any car-themed film, besting the 2006 animated feature "Cars," which raked in more than $60 million in its opening weekend and went on to earn more than $244 million at the box office. Neutral: Do You Care About Speed Records? Do you really care about how fast a car can go with a test driver on a closed course? Do you care how fast a Viper or a ZR-1 can go around Laguna Seca with a pro hot shoe who is way faster than you'll ever be?